Evidently word got out: MIT’s spacious Kresge Auditorium filled to the brim Saturday evening. 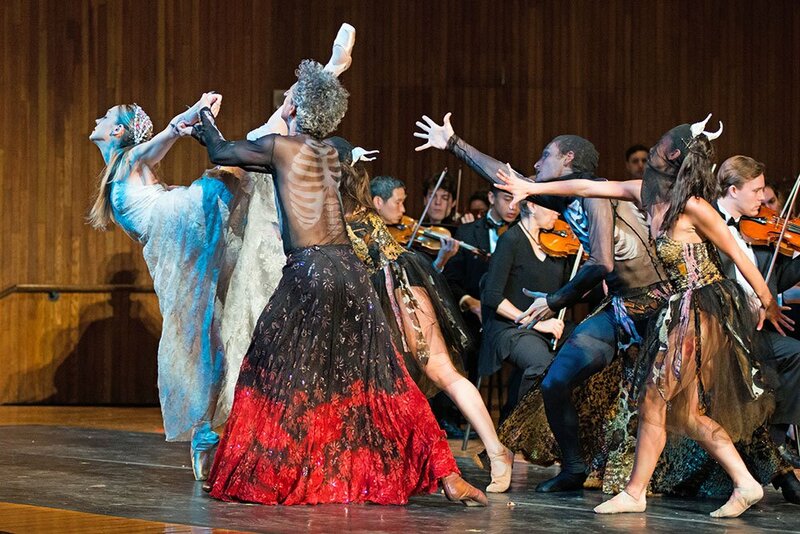 The ticket promised two supernatural folktales from the Cambridge Symphony Orchestra along with a small NorthEast ArtSpace small corps de ballet. The pairing of Dvořák’s little-known Water Goblin with Stravinsky’s Firebird elicited ardent response from on stage and in the house. Dvořák’s bland melodies, tepid rhythms, and flummoxing shifts of tempo failed to summon up a horrific creature that snatches a young girl then forces her to live with him in his underwater kingdom. However, good reason for undertaking the unfamiliar 1896 work surfaced in its orchestration, which gave the 80-plus CSO volunteers a splendid 20-minute showcase. After a brash opening emphasized by a crashing cymbal, Music Director Cynthia Woods, with the steadiest of hands, directed the orchestra’s focus on the score’s vibrant colors. Its transparency was satisfyingly borne out, especially as the strings, along with dabs of winds and brass, vivified the its supple configurations of timbres. Following that symphonic folktale with something inevitable bordered on the impossible, but what stretched our patience even more, was the 40-minute gap before the CSO returned to the stage. 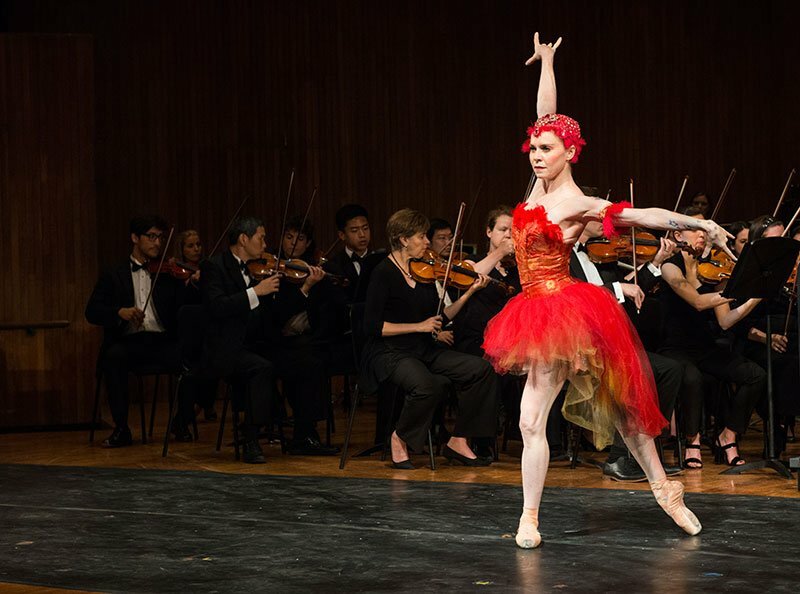 As with the Dvořák, convincing storytelling, even with the provision of dancers in The Firebird, became questionable, minimalized and sometimes misdirected in the debut of this new semi-staged production, featuring choreography by former Boston Ballet dancer Glanni Di Marco with costumes by Boston-based dancer Ruth Whitney. Often during the 45 minutes of Stravinsky’s hugely colorful original complete ballet score of 1910, Woods and the CSO managed quite well with no dancers onstage, yet curious stoppages of action resulted. “The dancing … is only intended to be a complementary addition to the music, the ‘whipping cream on the cake,’” Di Marco noted, which may explain part of the problem with the production. Supertitles above the Kresge stage would have aided this confusing retelling of a complex tale comprising no fewer than 20 dances in the two tableaux. No wonder Stravinsky’s concert version can be enjoyed solely on the musical level, where in the lengthy choreographed original, the devil is in the details. For instance, the elusive necessity of the magical bird’s not being exposed remained unexplained in a pas de deux with the Prince in the arms of the Firebird. Another intimate duet involved the Prince and a princess before she had been set free from a spell cast upon her by the evil magician. Ruth Whitney’s exquisitely expressive, ever elegant dancing as the Firebird had to constitute the evening’s highlight. In addition, her work as costumer visually pronounced the loveliness and purity of the princesses, in deft contrast to the hideousness of Kashei’s wicked retinue. When interacting, these dancers provided the only real action of the evening. At least two cheers to Woods and the Cambridge Symphony Orchestra, though, first for electing to take on the complete Firebird even with a diminished dance component, and second, for larding that tough bird with nuanced hue, elevated gesture, and multifaceted orchestration. Part of the pleasure here was the context: A young audience, other things going on outside, a fine evening to be outside during that intermission – and someone, from one of the other activities, walked by and handed me a cup of popcorn. One thing did trouble me: The tattoos on the lead ballerina. Did others find this to be positive?